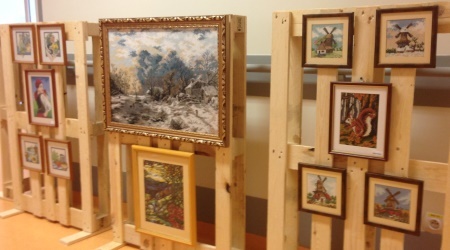 The 80th birthday of one of its patients was the perfect occasion for Poland’s Koscierzyna centre to display his artistic skills. On 29 September, a special art exhibition took place in Diaverum’s centre in Koscierzyna to celebrate the 80th birthday of Mr Michal — a patient who has been on haemodialysis for over seven years. His works are pictures made by a method of cross-stitch embroidery. His adventure with embroidery started when he retired 15 years ago and continues until today. The 30 embroideries presented during the event are only one third of all of Mr Michal’s work. Everyone was delighted with the exhibited works and admired the talent of the author. The opening of the exhibition was very solemn. Mr Michal presented the clinic with an embroidered Diaverum logo, while he received a birthday cake and a ‘Certificate of a honourable patient’. Those present then sang the traditional Sto lat, the Polish equivalent of ‘Happy Birthday, and the dialysed patients from his shift gave Mr Michal a bunch of flowers. Mr Michal did not even try to hide that he was both very pleased and touched. Regardless of his age and the therapy, Mr Michal is still full of vitality, has a great sense of humour and is very much engaged in his passion. The exhibition was available to all persons visiting the clinic between 28 September and 2 October 2015, including the patients of both the dialysis centre and the nephrological outpatient clinic, their families and our staff.